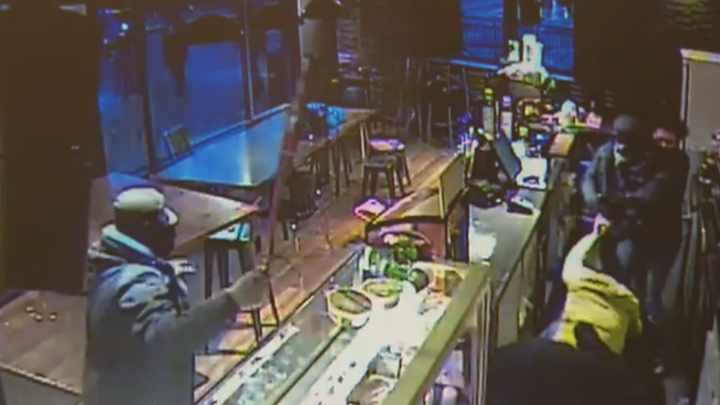 Dramatic CCTV footage shows the moment staff in a coffee shop were violently attacked by an armed gang. A group of men stormed Coffee Kup in Birmingham city centre at around 18:00 BST on Wednesday. The attackers, wielding baseball bats and hammers, attacked staff behind the counter and a security guard, who was left with a broken arm and hand. West Midlands Police said the gang fled the scene in a black car and investigations were under way. Shop owner Lakh Dhillon said the attack was "quite horrific", and called for more police patrols in the area. "Staff were doing their duties when four guys came into the store wearing balaclavas with hoods and carrying baseball bats and hammers," he said. "They just opened an attack on staff members and tried to destroy the premises. "There is a rise in crime which has been reported to the police on numerous occasions, but very little is done." Manager Manpreet Kaur added: "They just came inside and started fighting with the security guard which was horrible, and he got very badly injured. "I felt sorry for him because he helped my other colleagues, which I really appreciate." Nothing was stolen in the attack. Mr Dhillon said he had endured more crime at other businesses he owns. "We have had other instances in the city centre varying from stolen charity boxes to racial abuse," he said. Police urged witnesses to come forward with information.